Previously I have discussed the best Masters programs in data science and big data analytics in USA and Canada. 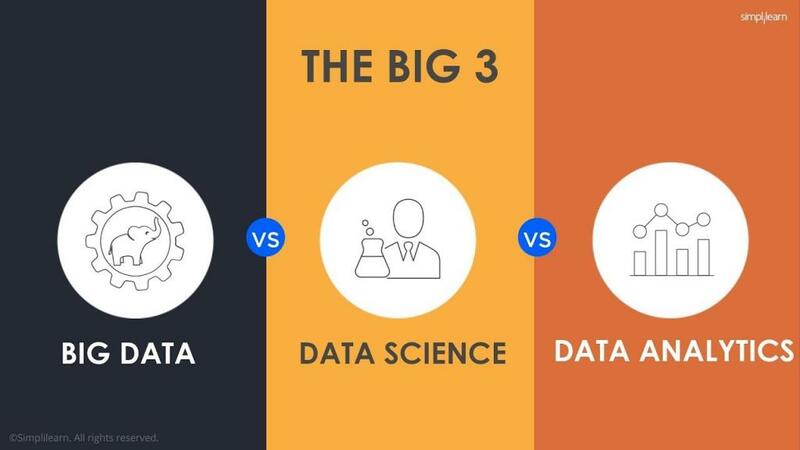 On popular demand, I am going to discuss and provide a brief overview of the best masters programs in data science, big data and business analytics in Europe. Europe is an excellent destination from the point of view of the quality of education, the flexibility of course curriculum, practical and research-orientation, industry links, and mobility (trans-national studying opportunities). There are hundreds of good programs in Europe in the field of data science and data analytics. So, I will be covering them in a series of two posts. However, before going through the list of universities, let’s take moment to look at a few important aspects. Why do we need Data Scientists and Data Analysts? As we all know by now, big data has been influencing businesses (and human lives) like few technologies or trends have done so before. Big Data is described as the large volume of data both structured and unstructured. It is a data whose scale, variation and complexity require new techniques, algorithms, and analysis to manage it and extract hidden knowledge and value from it. The use of Big Data is becoming a crucial way of leading companies to outperform their competitors. All of us are surrounded by the massive amount of data. Exploiting these huge amounts of data requires sophisticated mathematical and computer-based techniques to extract relevant information. Businesses today face increasing difficulties in recruiting “Data Scientists”, who are able to understand these issues and manage this strategic issue for their development. Big Data is a transversal issue that impacts many sectors of the economy: retail, public services, high-tech industry, banking and financial sector or biomedical sector with the advent of personalized medicine. Working knowledge of basic tools in statistics is essential. 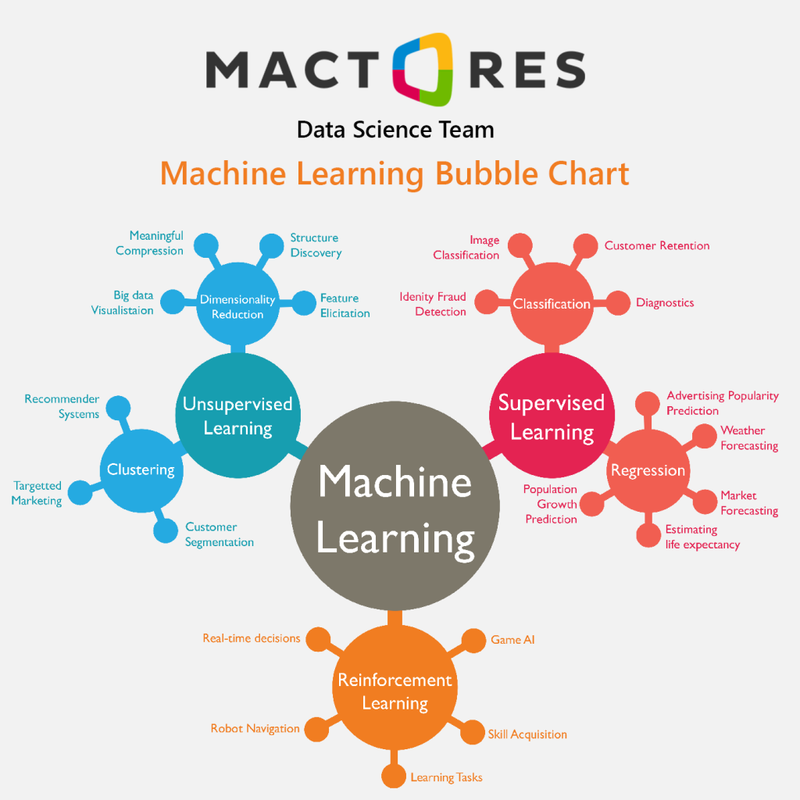 Intimately linked to statistics, machine learning is one of the fundamentals of data science. A proficient data scientist should know the difference between supervised and unsupervised learning, the notions of over-learning, and cross-validation cross. Additionally, a good knowledge of classical algorithms – decision tree, support vector machines, a neural network is also essential. Next, you need to know development and computer architecture. A data scientist must be able to develop and independently test and validate the models. Hence, mastering a scripting language such as Python and/or R is absolutely essential. On the top of that, a data scientist needs to acquire skills in storage and data processing tools: how to manipulate a relational data management system (SQL) or non-relational (NoSQL technologies such as Cassandra or MongoDB), know the new distributed and parallel computing technologies: MapReduce, Hadoop ecosystem (Hive, Pig, etc), parallel computing or in memory (Spark) or indexing (ElasticSearch). Last but not the least; you need business acumen, or in technical jargon – business intelligence as well in order to be a successful data scientist. 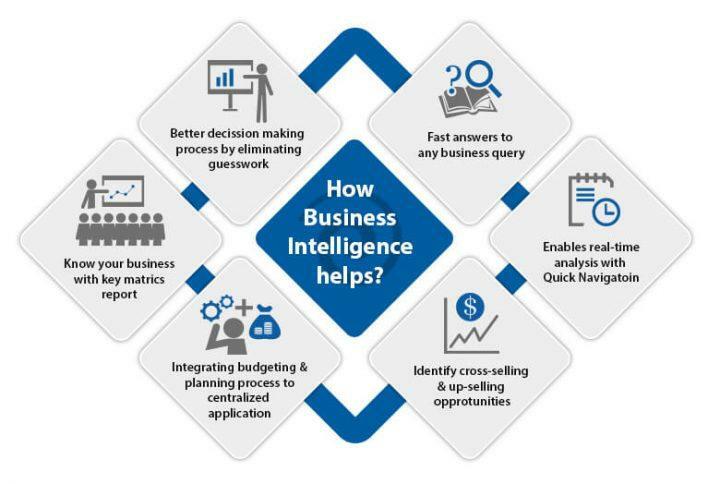 Business Intelligence (BI) involves all the components of the operation; from the time when data is collected to the time, it gets accessed. BI deals with the transformation of raw data into useful insights for analytical purposes. Analytics is the process performed on the data delivered by BI to generate meaningful insights with the purpose of decision driving and revenue (or impact) generation. 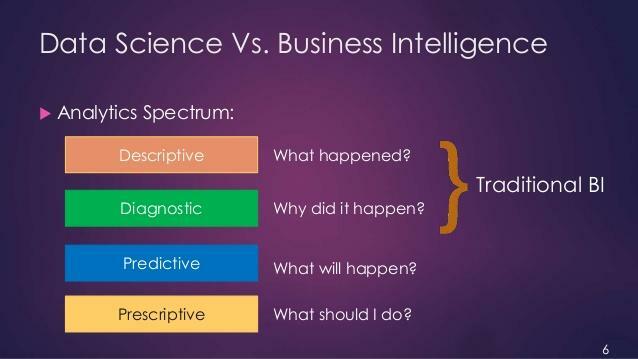 Read more on Business Analytics vs Business Intelligence. 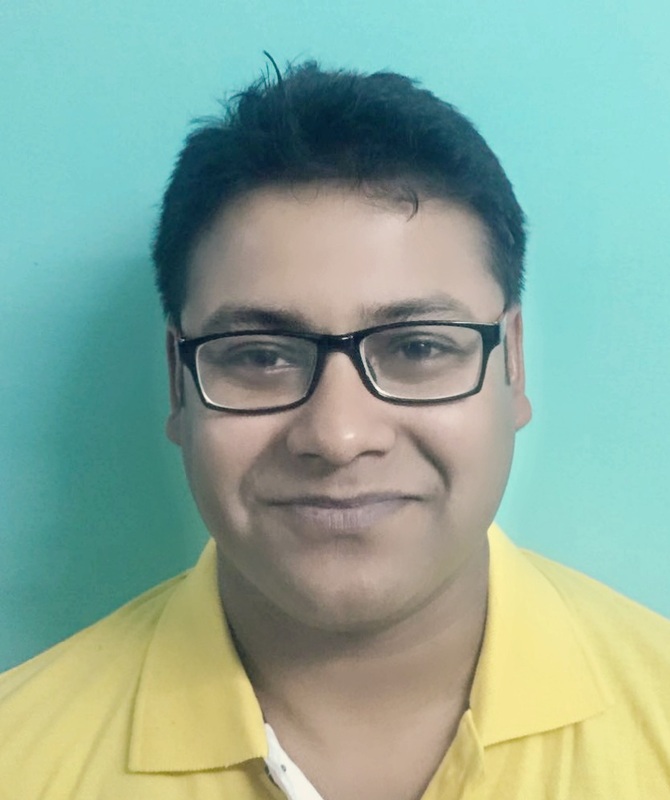 I have selected the programs after evaluating the course content, interdisciplinary nature, departmental profiles, industry links, research activities, trans-national nature, program reviews on other websites (KDnuggets, AnalyticsVidhya, Masters Portal, Quora) and job prospects. Additionally, I have listed only those programs that are entirely taught in English. This is a specialized Master’s program in Data Science that combines both theoretical foundations and practical applications. This is one of the best programs in for the folks who wish to get employed as data scientists in the industry – banking, insurance, biotech, medicine, environment, telecommunication etc. 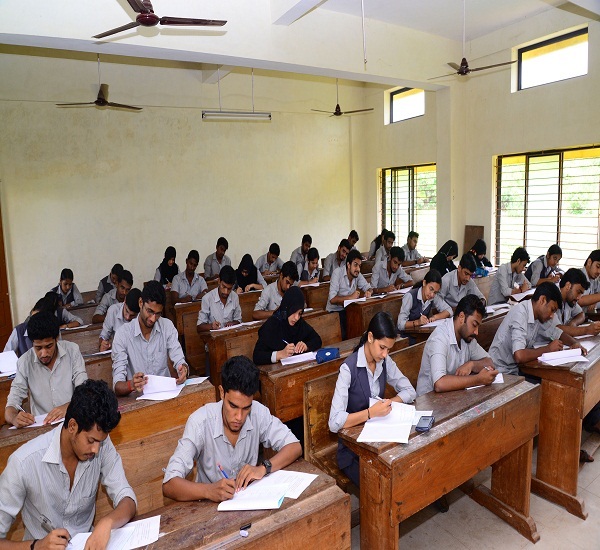 The 2-year program is jointly offered by the Departments of Mathematics, Computer Science, Information Technology, and Electrical Engineering. 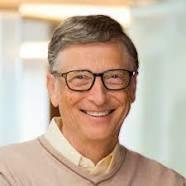 The program will prepare students to extract relevant information from the massive amount of raw data, and enable computers to make intelligent decisions. Read more about MSc in Data Science at ETH Zurich. The Data Engineering and Analytics program deals with the recent developments and trends in Big Data. The Master’s program specifically addresses three key issues – the creation and storage of large data sets in a feasible and economical way, technical advances in multi-core systems, cloud computing & related technologies, and various data sources (business, social media, smart devices etc.). The program is divided into three areas of study: Data Analysis, Data Engineering& Analytics, and Data Engineering, and covers the fundamental methods and practical techniques for the processing of very large datasets. Read more about the Data Engineering and Analytics program. The Mathematics in Data Science program runs parallel and shares the core foundations of informatics and mathematical aspects of Big Data. Both programs aim at the collection, modeling, storage, processing and evaluation of extremely large (e.g. social media), rapidly changing (e.g. sensor data) and complex (e.g. ecological systems) data sets. The Mathematics in Data Science program focuses on computation, simulation and prediction of complex phenomena (e.g. customer behavior, economic trends and medical data) and on the oftentimes complicated interpretation of this data, which requires complex mathematical models. This program places an emphasis on methods and algorithms from statistics, machine learning, optimization, and the theory of data representation. This is aimed towards the students who want to receive a high-profile education in mathematics with an emphasis on the burgeoning area of Big Data. Students will gain an in-depth understanding of detail complex techniques for data editing and data analysis, how to adapt complex models to concrete problems, to combine and redevelop them in order to derive prediction and classification models. The fourth semester is devoted to the elaboration of a dissertation thesis in either a laboratory or a company. The network of partnership agreements set with leading laboratories and major companies where students may perform internships during the last semester will offer to holders of the EMMC degree in DMKM multiple employment opportunities in high-tech industry, business intelligence companies, banking & finance, or research and academic environments. The program is offered in English, and language classes are also provided to ensure that the students integrate into the socio-cultural environment of the host country, and to prepare for the employment opportunities & mobility. Read more about the Erasmus Mundus Master in Data Mining and Knowledge Management program. The Data Science Masters offers a unique two-year academic programme, whereby students study data science, innovation, and entrepreneurship at two different leading European universities. The participating universities are TU/e Eindhoven, UNS Nice Sophia-Antipolis, UPM Madrid, KTH Stockholm, TUB Berlin, and PoliMi Mailand. Students acquire in-depth technical skills in scalable data collection techniques and data analysis methods. They learn how to use and develop a suite of tools and technologies that address data capture, processing, storage, transfer, analysis, visualization, and related concepts (e.g., data access, data pricing, and data privacy). At the same time, they also acquire extensive business skills by learning how to bring innovation to the market and developing a successful business model. 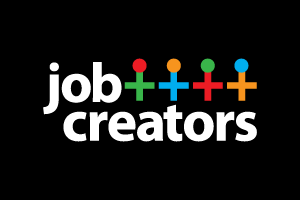 These additional entrepreneurial skills will give students their ticket to a successful career. It’s a unique program during which students study one year at an ‘entry’ university and one year at an ‘exit’ university in two of EIT Digital’s hot spots around Europe. After completing the course, graduates receive degrees from the two universities and a certificate awarded by the European Institute of Innovation and Technology. Read more about the Master in Data Science at EIT Digital. Earlier the program used to known as IT4BI (Information Technology for Business Intelligence). The program favors the integration of students into a network of specialists and researchers in Business Intelligence (BI) and Big Data (BD). The curriculum is jointly delivered by Université Libre de Bruxelles (ULB) in Belgium, Universitat Politècnica de Catalunya (UPC) in Spain, Technische Universität Berlin (TUB) in Germany, Technische Universiteit Eindhoven (TU/e) in the Netherlands and Université François Rabelais Tours (UFRT) in France. This consortium will prepare the graduates not only to answer today s professional challenges by a strong connection with the needs coming from the industry but also to pursue their studies into doctorate programs, through strong connections with the researchers and innovators views. The first semester at ULB introduces students to core BI concepts like traditional data management, business process management, and data analytics. The second semester at UPC covers BD fundamentals: distributed management to deal with Volume, semantic management to deal with Variety, and distributed stream-based management to deal with Velocity. The second year focuses more on the business and entrepreneurial aspects. The specialization in “Large- Scale Data Analytics” at TUB focus on data analytics on both large, heterogeneous data, but also on fast, high-throughput data, i.e., dealing mainly with Volume, Velocity, and Variety. The specialization in “Business Process Analytics” at TU/e offers the bridge between data mining and business processes modeling and analysis, i.e., dealing mainly with Variability and Value. The specialization in “Content and Usage Analytics” at UFRT concentrates on the accuracy of the analysis on heterogeneous data, dealing mainly with Value, Variability, and Veracity. Know more about the Big Data Management and Analytics program. The 2-year EPFL’s Master program in Data Science offers a comprehensive education, from the foundations to implementation, from algorithms to database architecture, and from information theory to machine learning. The Master program is offered by the School of Computer and Communication Sciences in collaboration with the Institute of Mathematics and the School of Engineering. At EPFL, students will have solid exposure to cutting-edge research and to exciting industrial internship and career opportunities in various fields such as biotechnology, education, energy, finance, government, healthcare, insurance, pharmaceutical, telecoms, travel, and transportation etc. Besides, the Swiss Data Science Center and the Digital Humanities Institute (DHI) offer exciting networking and training opportunities. Know more about the Master in Data Science program at EPFL. This is a 1-year program across two counties (France and Germany) and offered by the ESCP Europe, one of the top business schools in the world. It’s another trans-national program that takes place at Paris and Berlin – two great places for the usage of big data & business analytics, cultural mix, and international corporate network. The program provides an excellent opportunity to strengthen skills through courses on Business Intelligence, Data Science, Data Modelling, Business Process, Managerial Decision Making and various Analytics areas. Know more about the MSc in Big Data and Business Analytics program at ESCP Europe. This program provides a solid foundation of mathematics and statistics along with methods for machine learning (ML) with the goal of modeling and discovering patterns from observations. Students will also gain practical experience of how to match, apply and implement relevant ML techniques to solve the real-world problems in a large range of application domains. Graduates will gain the confidence and experience to propose tractable solutions to potentially non-standard learning problems which they can implement efficiently and robustly. The first term of the program covers compulsory courses in machine learning, artificial intelligence, an advanced course in machine learning and research methodology. Students will gain an understanding of how machine learning is used to solve problems in particular application domains such as computer vision, information retrieval, speech and language processing, computational biology and robotics. The third term allows the students to deepen their knowledge of theoretical computer science, software engineering, and parallel computing. The final term is dedicated to a degree project which involves participating in advanced research or design projects in an academic or industrial environment, in Sweden or abroad. At KTH, students will have the chance to complete projects at companies such as Saab, Elekta, Flir, Eriksson, Tobii, Spotify, Thales, Huawei etc. Know more about the Masters in Machine Learning program at KTH. This program is aimed at Big Data Science specialists with hands-on experience, and those who are in leadership roles working with Big Data Science and for Entrepreneurs. The curriculum of this MBA is highly multidisciplinary, with courses from Analytics, Business, and Computer Science, and with projects to practice and implement the integration of these three aspects. Learn more about the MBA Big Data & Business Analytics program. 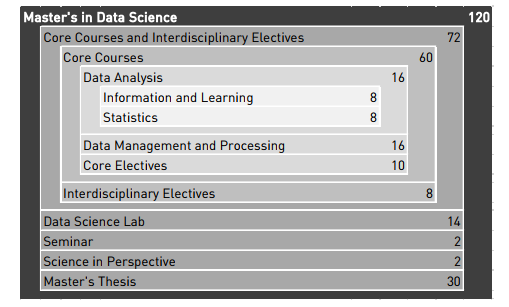 The Data Science and Analytics program at Leeds is a highly flexible and interdisciplinary course. Students can develop a range of skills, including analyzing structured and unstructured data, analyzing large datasets and critically evaluating results in context, through a combination of compulsory and optional modules. Students can choose specific pathways (specializations) – business management, healthcare or geographic information systems (GIS) according to their background and needs. The course combines expertise from the Schools of Computing, Geography, and Mathematics with that of Leeds University Business School and the Yorkshire Centre for Health Informatics. 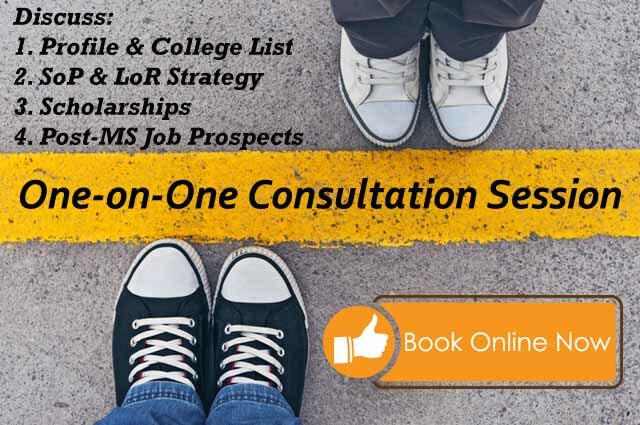 Apart from three core modules, the program offers a comprehensive list of elective modules. Read more about the MSc Data Science and Analytics program at Leeds. Not much-hyped program in the media and major study abroad portals; but, it’s one of the best programs for studies and research in data science. 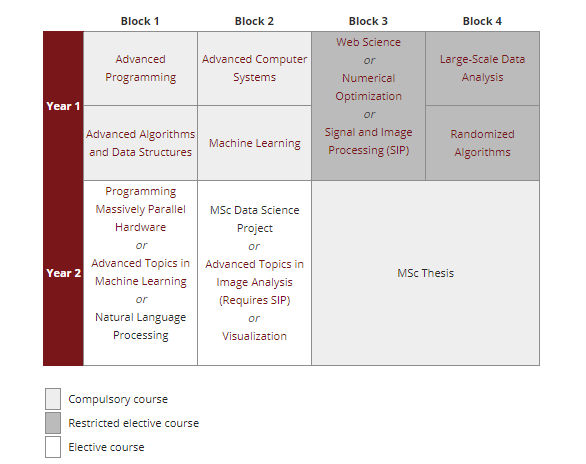 The MSc Computer Science program includes algorithmic and data structures, programming languages, data science and machine learning, HCI (human-computer interaction), image analysis and computer vision, as well as software development. The data science track offers an excellent curriculum for the folks, who have got knowledge of programming, mathematics, and statistics. 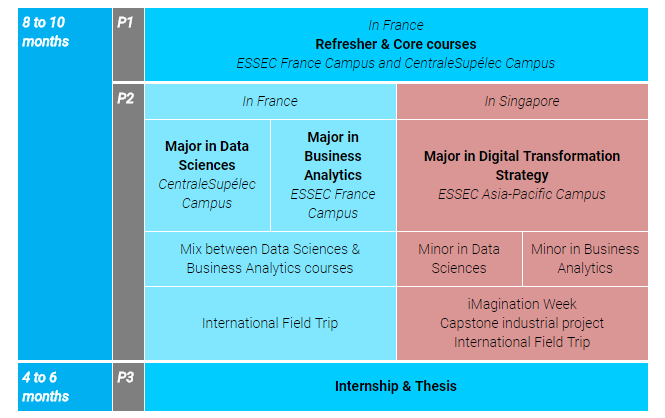 Know more about the MSc in Data Science & Business Analytics program at the ESSEC Business School. Image Sources: SimpliLearn, DigitalVidya, University Websites.